MISSOURI CITY, TX--(Marketwired - March 30, 2016) - College Hunks Hauling Junk and Moving -- which has been featured on Blue Collar Millionaire, Shark Tank, and other primetime shows -- has come to southwest Houston. 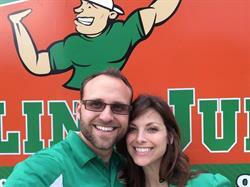 The moving and junk removal franchise will be headed up by local co-owners Ryan Shahan and his wife Ashley Shahan. The downturn in the oil industry convinced the Shahans to pursue the opportunity to own their own business. Ryan was a safety advisor for a major oil drilling company when he found out they were offering voluntary severance packages. Ashley was a preschool teacher who wanted to spend more time at home with their three children, while also running a business. They decided to use Ryan's severance package to invest in their future and purchase a College Hunks Hauling Junk and Moving franchise. College Hunks Hauling Junk and Moving is the fastest-growing junk removal franchise and moving franchise in America. The company has made Entrepreneur magazine's list of top franchise opportunities for six years in a row and continues its nationwide expansion by bringing professionalism and sophisticated marketing to an industry that is in constant demand. "What set it apart for us is that it is a values-based company," Ashley says. "We really identified with the fact that they care a great deal to meet the needs of their customers. College Hunks is a business that really seeks to do the best thing by their customers, and to be an honest company." "Any company can say they have values," Ryan added, "but if they're not actually standing on those values, then it's going to fail. The values that College Hunks has definitely lined up with our own personal values." Building leaders. Employees are encouraged to learn and master every aspect of the business, and College Hunks provides a clear path to advancement, as well as intentional lessons in entrepreneurship to help new employees gain management, marketing, and customer service skills, and to potentially become business owners themselves. Always branding. Everyone is encouraged to consider how each action they take impacts the community and customers, and to strive to make better for everyone we interact with. Create a fun, enthusiastic, team environment. College Hunks Hauling Junk has a collegiate, and collegial, atmosphere. As the company's tongue-in-cheek name implies, it doesn't take itself too seriously, even as franchisees and executive leadership focus on teamwork and customer service. Camaraderie, enthusiasm and excitement are big components of the brand. Listen, fulfill and delight. College Hunks pay attention to customers, listen to the issues that may surround their need to declutter or move, and then look for ways to care for customers and deliver a stress-free experience. College Hunks Hauling Junk has become a nationwide, multi-million dollar brand by bringing professional service and bold marketing to an ancient industry. Moving and decluttering are not new, or trendy, but they are universally needed activities, and the Shahans were attracted to College Hunks Hauling Junk because of how the franchise has raised the bar in the industry. "College Hunks has taken a wealth of knowledge from current successful business owners, pretty much packaged it up in a very understandable way, and we can take that information and learn from it, and grow with it and establish systems," says Ashley. "They'll always answer our phone calls. They'll always answer our emails, and any way we need support, they're there to help us out." "What it allows us to do that we couldn't do before is to accumulate resources to then go out and accomplish even bigger dreams and a bigger vision that we have for ourselves and for us a couple and for our family," Ashley says. " Whether it be relationships or financial gain, whatever it is, we have the opportunity to fulfill a bigger dream for our lives." Ryan also looks forward to the freedom to call shots and do things the right way for customers. "You have the freedom to do what you need to do. You have the freedom to make the decisions you need to make. You have the freedom to build the way that you want to build. You have the freedom to interact with customers the way that you need to interact with customers, and provide for your employees the way that you know they need to be provided for." Why did Ashley and Ryan Shahan purchase a College Hunks Hauling Junk Franchise? The Shahans are bringing new professionalism to an old industry. 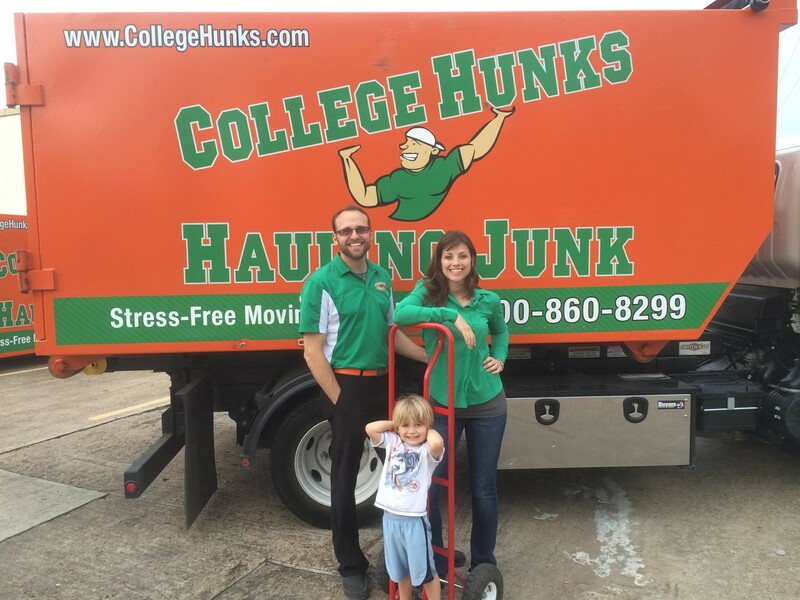 Ryan and Ashley Shahan opened a College Hunks Hauling Junk and Moving franchise in Missouri City, Texas, southwest of Houston.